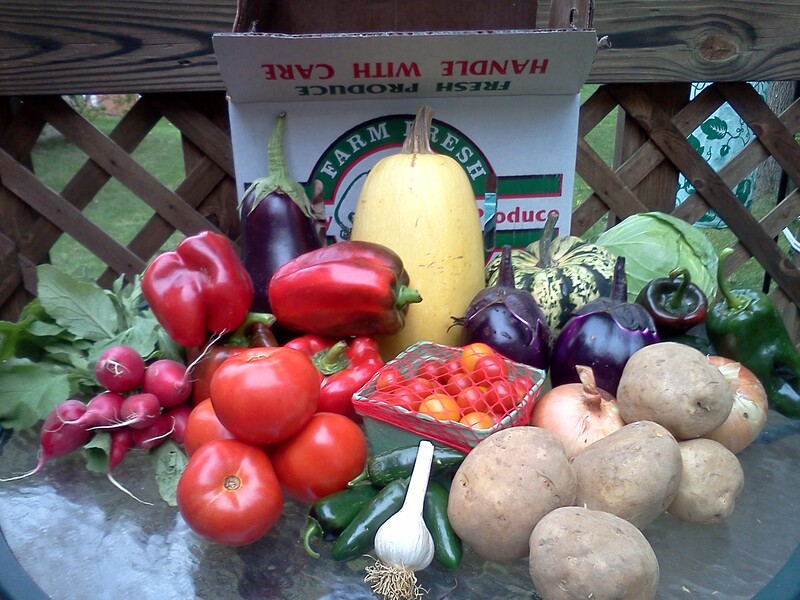 Another fabulous week of veggies from Basket of Life Farm! Today, my box had a spaghetti squash, a carnival squash, cabbage, multiple eggplants, potatoes, onions, cherry tomatoes, jalapenos, garlic, tomatoes, poblano peppers, red peppers and radishes! I’ve loved getting my CSA box each week, and I realized today just how much I’m going to miss it when the season is over. Grocery store produce just is not the same. Luckily, it’s not over yet! 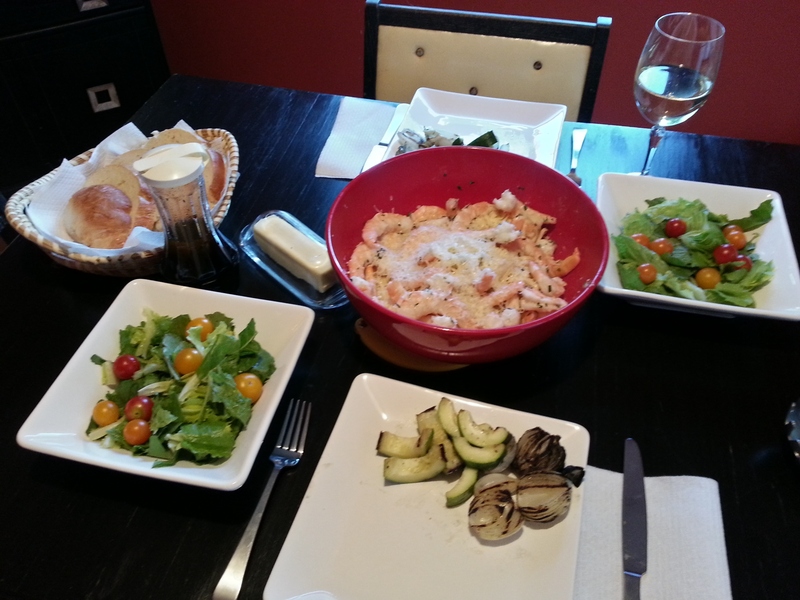 I cooked quite a bit last week, including some new recipes I hadn’t tried before. 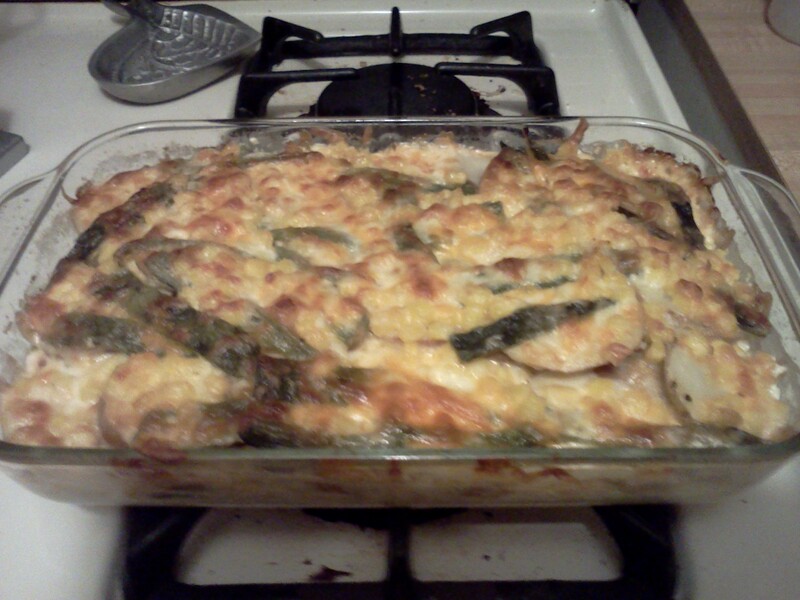 I highly recommend the Poblano and Potato Gratin from the Food Network show Mexican Made Easy. The roasted poblano peppers with the cheesy potatoes were super tasty, and were great as leftovers the next day! Poblano and Potato Gratin – fresh out of the oven! I also “borrowed” Mom’s recipe for baked shrimp with white wine and herb butter over pasta. I was proud of this meal – grilled CSA veggies, fresh salad … I even made the bread and the salad dressing! (Balsamic vinegar, olive oil, minced garlic and honey – simple but really yummy.) Plus, I don’t often set the table all fancy, so I enjoyed that as well. 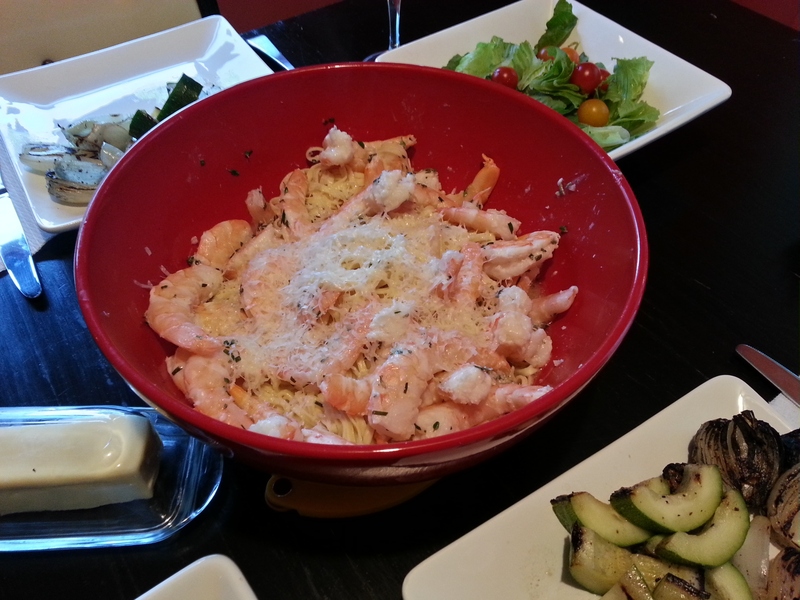 Shrimp and Pasta – classic! Plus, this week I tried that Spaghetti Squash soup – although now that I have another spaghetti squash, I need to come up with another recipe to try! Oh, and this was interesting. I had quite a bit of cabbage from the last couple weeks of CSA that I just could not use fast enough. Basket of Life sends a weekly email listing what we can expect in our CSA boxes, and links to recipes. Last week, the email included a link to how to freeze cabbage. I was intrigued by it, and I had extra cabbage, so I figured why not? I followed the instructions, and now have two big bags of shredded cabbage in my freezer! When I use it in a recipe down the road, I’ll let you all know how the cabbage freezing experiment turned out. I hope everybody else had as much fun with food as I did this week! This entry was posted in General on September 21, 2012 by Melissa. Thanks for sharing your poblano and potato gratin. It was so good! Had some heat to it. Loved the combination of the creamy potatoes and the spicy peppers. YUM! Thanks! That’s probably one of my favorite recipes that I’ve tried this year. I’m definitely going to have to make that again! The poblano and potato gratin was amazing! We’re very luck that you share!! I’m lucky I have you to help me with leftovers! Glad you liked it. I have plenty of poblanos and plenty of potatoes. On my way to make that one!